With that pronouncement, Batya Selavan grins. A quick talker who exudes energy and confidence, she’s standing by the oversize gold bell at JVS Career Services in Blue Ash. It’s clear that being asked to offer advice to those still looking for work has hit a chord. It was a long and difficult road for a motivated worker. 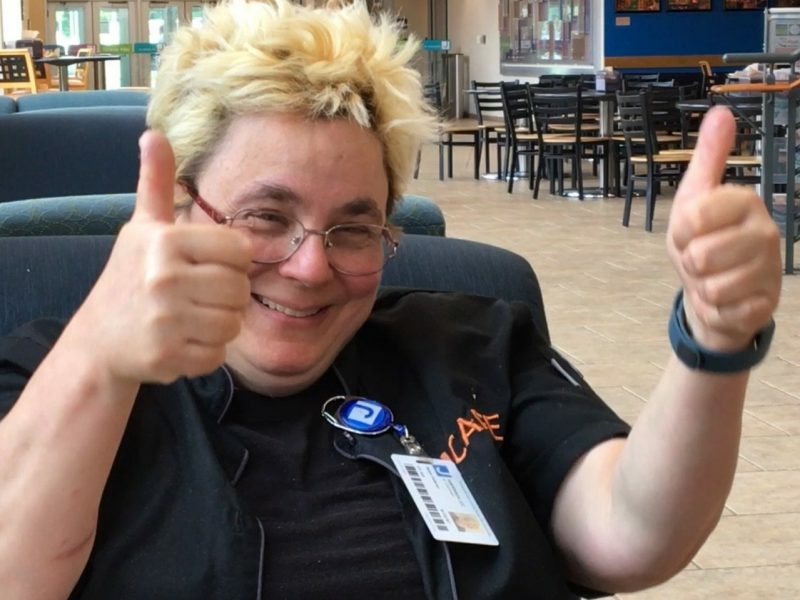 After ten years scanning medical records, Batya attended vocational school at Scarlet Oaks to become a medical billing and coding specialist, which she had hoped would be a step up. However Batya searched for more than seven months, applying for 60 different jobs. With no luck. “I try to approach things in a positive way, but I felt very frustrated. Why hadn’t people called? I went on a couple of interviews and didn’t get hired, but I didn’t give up because I had to make ends meet,” she said. Then Batya found JVS Career Services, a local nonprofit that helps job-seeking individuals find meaningful work, and met Kim Slaton, the Managing Director there. 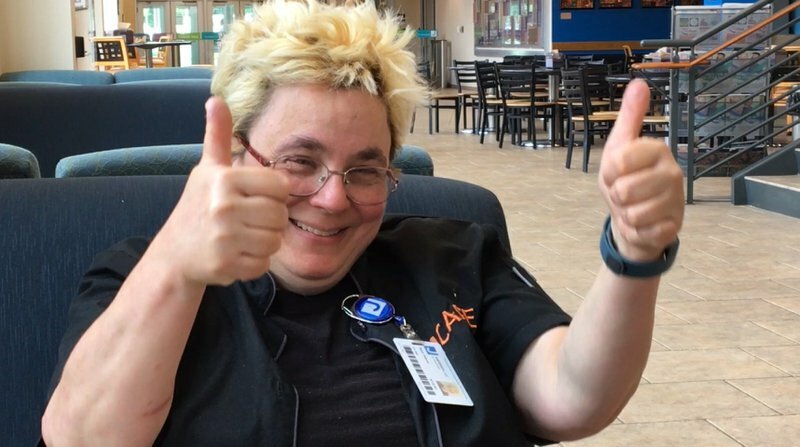 “Over the course of a year, we helped Batya through coaching, practical support, punching up her resume, connections to possible employers, and more,” said Slaton. Because of her previous food service experience, they also decided to open up Batya’s options to include food service jobs. Things looked good right away. “I came for an interview, and here I see Drew [Brown, Director of Food Services and Strategic Initiatives at the Mayerson JCC,] and I had worked with him 20 years ago, and I thought that was pretty cool. We had a nice conversation and they gave me a tour of the [JCC] kitchens. Then I had a working interview, and they were impressed with how fast I was washing dishes, so the next thing I know, I’m hired. And they said: no probation period for me, that was it, they found their team,” said Batya, smiling. “The people at JVS have just been wonderful with their motivation and their support,” said Batya. Anyone can see that Batya works extremely hard. She has continued a 10-year part-time position at Sears, and will keep the new part-time job at Temple Sholom too. As is the tradition at JVS Career Services, Batya came back to visit and to ring the gold bell that everyone who succeeds in getting a job rings to celebrate. She said, “When I rang the bell there was that good feeling of adrenaline—and I just went wham!” And true to form, she kept on smiling. After a year-long job search, Batya is pleased with her new job and her new team.